Students, staff, families and community members read books at the African American Read Aloud at Tenderloin Community School. 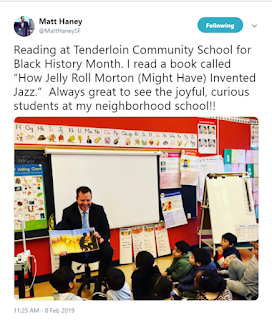 Students at Tenderloin Community School (TCS) enjoyed hearing books read aloud at the school's annual African American Read Aloud with some special guests this year. Organized by Ms. Bailey, the school's family liaison and student advisor, the read aloud features books that celebrate African American heritage. The event happens during Black History Month in February, when schools throughout San Francisco incorporate classroom lessons and other activities dedicated to highlighting the many contributions of African Americans, while also celebrating Black History all year long. 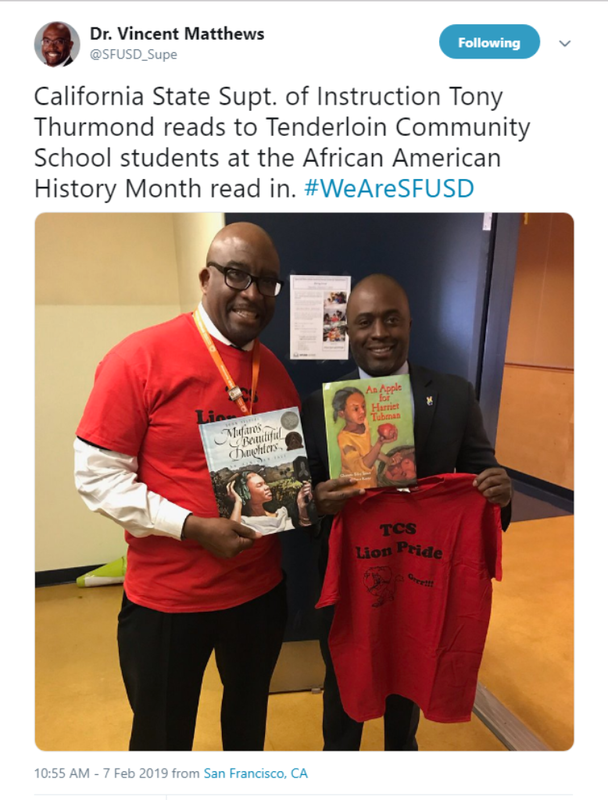 This year's African American Read Aloud at TCS included State Superintendent Tony Thurmond, San Francisco Unified School District Superintendent Dr. Vincent Matthews, District 6 Supervisor Matt Haney and Board of Education Commissioner Alison Collins. "I read a book called 'How Jelly Roll Morton (Might Have) Invented Jazz.,' Supervisor Haney posted on his Twitter page. "Always great to see the joyful, curious students at my neighborhood school!" Supervisory Haney reads to students at Tenderloin Community School. Superintendent Matthews and Superintendent Thurmond even posed for a photo together with their "TCS Lion Pride" shirts. Dr. Matthews and Superintendent Thurmond at Tenderloin Community School. It wasn't just the superintendents who felt pride that day. "TCS has been a great school for my daughter, and it deserves recognition for all that it offers to the students and their families," parent Scott Bravmann said. Indeed, the 2017-18 School Accountability Highlights for TCS notes that 95 percent of all families at the school say there is a favorite climate "conducive to learning and that teachers use supportive practices, such as: encouragement and constructive feedback; varied opportunities to demonstrate knowledge and skills; support for risk‐taking and independent thinking; atmosphere conducive dialog and questioning and academic challenge."